Sometimes, unplugging everything from your PC and opening it up just to find out what the model of the motherboard or PCI card is turns out to be a real pain. There are a few utilities out there that you can simply run and they will tell you what hardware and software live in your PC. One of the more popular system audit applications is Belarc Advisor. After installing, you can run it, and it generates an HTML report listing installed hardware and software. It’s very easy to use. Another (albeit lesser-known) system audit application is SIW. This one requires no installation, and offers excessive detail on installed hardware and software. To build a report, simply go to the “File” menu > “Create Report” and click “HTML”. This will create a report in an HTML file that will be fairly easy to navigate. Just let me stress this is a highly detailed report. If you click the “Options” button on the report generator window that pops up, it will allow you to select what areas of detail you want to see in the report. Either one of these are handy tools to put on your USB flash drive. Be sure to give each one a couple minutes or so to build the reports. Tired of the same ol’ games you’ve been playing for months? Can’t find anything new to play? You’re in luck–Wikipedia has two lists of free games that you can download and play. And no, most of them don’t fall under the category of cheesy flash-based games on the web. Many of them are similar to what you would find on shelves today, or even in the style of console game favorites. The only difference between the two lists is that open source games distribute the source code and allow modifications. Otherwise, if you are simply looking for a game to play, anything on those lists is up for grabs. Have fun! To open up Windows Explorer (not Internet Explorer), simply hold the Windows key and press E. No matter where you are, this will open Windows Explorer. To navigate up and down, simply use the arrow keys. To open and close subfolders use the * and – keys on the num pad. Note that these shortcut keys open and close *all* subfolders on the selected folder, not just one level, so if you have a lot of files and subfolders, opening them may take a few moments. To open only one level of subfolders, use the + key on the num pad. Over the past several months, I’ve worked in an environment composed of both Macs and PCs. The Macs in question have mainly been employed for video work, so a degree of cross-platform usage goes on; video primarily on the Macs, and pretty much everything else on the PCs. There’s no avoiding the Macs since I work with both the IT and AV side of things. As a result, I’ve had to put these machines to use. 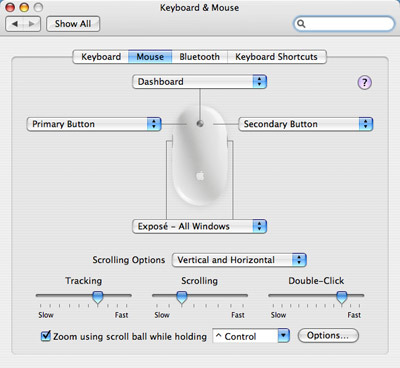 The right click mouse button needs no introduction, I’m sure. It’s quite useful in a Windows environment. It’s almost second nature at times. OS X…well…it’s at first maddening to discover that you’re limited to a single button. However, there’s two ways around it. First, hold down Alt while you click. The typical right-click menu you’re looking for should appear…about 80% of the time. For some odd reason, this does act a bit quirky if you don’t click just right. 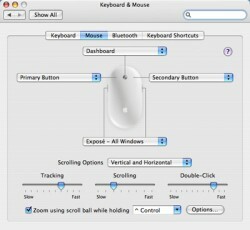 The better method is remapping your mouse buttons. This will work on Apple’s Mighty Mouse or any standard USB mouse (for you folks stuck using the infamous Apple “Hockey Puck” Mouse, or the slightly newer Apple Pro Mouse, you’re out of luck here). If you do the same thing as I did, pressing the scrollwheel brings up the widgets. Pressing either side of the mouse re-tiles displays all the open windows; either pressing again or clicking on a window gets you out of this. Right and left click act like they would under Windows. Since I’m working in a Mac & PC environment, I’m constantly moving files back and forth between the Macs and PCs. If it asks you to “mount a share”, it’s just asking which shared folder (or drive) you want to work with. If it asks you to login, use the same username and password as you would normally use to login to that PC. On the PC, just remember to share the folder you want, and make the folder writable if you want to be able to upload files from the Mac to the PC. Now for the tricky part: making the files on the Mac available to PCs. If you’re running OS X 10.4 or older, you’re in luck: there’s a neat utility to make file sharing easier called SharePoints. It allows you to specify what users you can log in as, and which users have what permissions to whichever folders you choose to share. This application is fairly straightforward. If you’re running the new OS X 10.5, unfortunately, enough has changed where SharePoints fails to work. As of the time of writing, there’s been no word yet if the developer of SharePoints is going to update the app for OS X 10.5. So, for the moment, I’m a bit stuck in this regard (especially since I really don’t want to mess with unix-based command line console). To enable sharing, click on the mighty blue apple in the upper left of the screen and click “System Preferences” and go to the “Sharing” tab. For “Computer Name”, put something easy to remember without any spaces or periods. This will be the name you use to access the Mac from the PC (you can also just use the IP address). Next, tick the check box on the “Services” tab that says “Windows File Sharing”. If you’re not using SharePoints, tick the “Personal File Sharing” as well. This shares the user’s public shared folders and will at least give you one set of folders to share. Choose the users that can be used to login when you access this Mac’s shared folders from another Mac or PC by clicking the “Accounts” button. Hit “Start” to enable file sharing. Lastly, if your firewall is on, you’ll have to allow sharing (it’s fairly self-explanatory). If you run into trouble or can’t find where things are, here’s a good page to take a look at. So, from a PC, go to Start > Run and type \\nameofthemac. You will be prompted to login, so use one of the user accounts that exists on the Mac. If you have everything configured correctly, you should be able to access the shared folders on the Mac. In Windows, I use a good many shortcut keys. The Home and End keys actually get used quite frequently with writing, coding, surfing, etc. For instance, if I hit the Home key, it goes to the start of a line, and then if I hit SHIFT + End, it highlights an entire line. This is useful in text documents when you don’t want to hit CTRL+A to select everything…only a single line; and quickly. Those two keys are also good for navigation, in addition to Page Up and Page Down (although I don’t use those two nearly as often). Anyway, this little tool addresses that minor annoyance. 4) Why Oh Why Won’t That App Minimize? Some applications have half a dozen mini windows that populate the entire screen. In the instance that you would like to minimize the app and move on to something else, you have to hit the minimize button on each one of those little windows…if they even have them (off the top of my head, Final Cut had been notorious for this, and I’ve found it quite annoying). Anyway, here’s a neat tip with wresting with apps that won’t minimize: Hit the Command key and press H. This hides the application (just make sure the “main” windows of the application has focus). If you want to navigate back to it, it won’t show up on the Dock because you didn’t actually minimize it! Oh no! Don’t worry, it’s not really lost. Hold the Command key and press Tab. This will cycle through all of the applications you have open. You can press Tab to advance to the next icon, or click on an icon with your mouse. Either way, the selected application will appear front and center. This is pretty much identical to the way the Windows ALT+Tab hotkey works. 5) Where Are The Shortcuts? In Windows, shortcuts are *everywhere*. Scattered on the desktop; scattered inside folders on the desktop; scattered in My Documents. Why do we have shortcuts? Easy access mainly, plus it avoids having to dig around in program directories for the correct executable file that actually runs the program. In OS X, shortcuts aren’t called “shortcuts”. They’re called “aliases”. Sure, the term makes sense in this context, but coming from Windows, you start out having no idea what you’re looking for. When you want to make a shortcut/alias, simply right click on the application’s icon, and click “Make Alias”. This will always create a shortcut/alias with the word “alias” in the new icon. To create an alias without the word “alias” in it (to avoid renaming it afterwards), hold down the Option and Command keys, then drag the application’s icon to wherever you want the alias/shortcut. I know I said there were going to be 5 tips here, but I can’t resist sharing the following gem. If you’ve been using OS X for even a little while, you may have discovered that the realm of freeware isn’t as vast as it is with the Windows platform. So, you either have to search long and hard, run a dual boot, run a virtual machine, or bite the bullet and spend that $15-$50 on an app that you can easily get for Windows at no charge. But, there is some freeware available, and you can see a good list of what’s available. Note that not all the apps may work under OS X 10.5 since it is still fairly new, but given some time, I’m sure most of the more popular ones will be made available for it. The most useful ones for me so far have been VLC, Firefox, Cyberduck, and SharePoints. And with that, I’ll leave you to exploring the OS X environment. As for me…I’ll continue to plug away with OS X as necessary, but I still feel very much more at home with Windows XP. This service allows you to either view PDFs that are linked somewhere on the web, or upload a PDF from your computer. While this service does fine with standard PDFs with basic text and image, you may run into issues with PDFs containing interactive elements. One annoying thing with PDFs and PDF Readers is that when you click on a link to a PDF, it opens in a browser window, rather than its own PDF Reader window. In Opera, go to Tools > Preferences and the “Advanced” tab. Select “Downloads” on the left site. On the list of MIME types, select “application/pdf” and hit edit. Select “Open with default application”. Hit OK, close the window, and you’re done. In Firefox, go to Tools > Options and click the “Content” button at the top. Click the “Manage…” button for File Types. Double click on PDF on the list. Select “Open them with the default application”. Hit OK, and close out of everything. For Internet Explorer, you’ll need to open Adobe Reader. In Adobe Reader, go to Edit > Preferences. Click on “Internet” on the list on the left. Uncheck the “Display PDF in browser” option and hit OK. Adobe Reader will configure itself and may ask for a reboot. One of the most common annoyances early on with IE7 was that the File Menu wasn’t on top like usual with most Windows applications. Here’s a quick registry tweak to move it to the top of the window where you would expect to find it. Create a new DWORD value named “ITBar7Position” with a value of 1. To undo this tweak, change the value to 0. 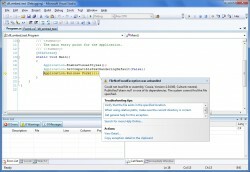 Outlook 2003 automatically displays error messages from the system tray when connectivity issues are detected. Unfortunately, when using mail servers off-site, these balloon tip error messages tend to appear excessively, even when there are actually no problems, proving them to be more of an annoyance than anything else. Create three DWORD values named “Exchange”, “NetConn”, and “NetWarn”, all with the value of 0. Close outlook and open it up again. If done correctly, balloon tip error messages will no longer pop up. Register for an account at http://dyndns.com. This is a dynamic DNS service where you can get a free custom subdomain, or for a small fee, register your own domain name. Once you sign up, login to your account, click on “My Services”. Under “Hostnames” click the link that says “Add New Hostname”. Assuming you’re on broadband, proceed through the wizard, select “Local Area Network”, hit next, hit “Detect My IP”, hit next, type in any sort of name, such as “mycomp”, and hit next. Enter your dydns username and password and hit next. Select “Yes” for the automatic download, and hit next. Verify that the domain that appears is the one you put on the dydns website. If it is, tick the box next to it and hit the next button. The rest is fairly straight forward. If all went well, you now should be able to reach your computer/network with the domain name, so you won’t have to remember the IP address.